Talk about talent! Alyssa Trinidad of Manchester, NH, left, agreed to let me have my photo taken with her at the Kamikaze Anime and Video Game Convention. Her zombie make-up is amazing…it’s no surprise her dream is to become a professional effects artist. As well she should. 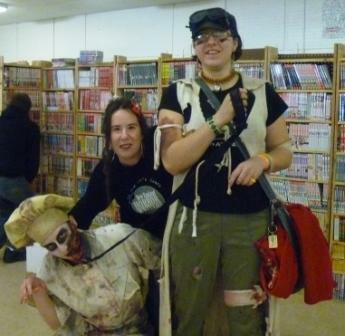 Skeletons in the Swimmin’ Hole and The New England Horror Writers had a blast up at the Queen City Kamikaze Anime and Video Game Convention at Manchester Memorial High School Saturday, February 18, in Manchester, NH. While none of us participated in cosplay, there was certainly plenty of it around (and lots of teenagers hopped up on sugar). We had a great time, and I think most of us agreed: man, we wish we’d had something like this in high school. ← Get horrified, play old Atari at the Queen City Kamikaze Anime & Video Game Convention this weekend!